The National Chairman of the Peoples Democratic Party, PDP, Prince Uche Secondus Secondus yesterday saluted the courage of the Vice President in sacking the Director General of the DSS, Lawan Daura to show that Nigeria cannot be hijacked and ruled by cabals. 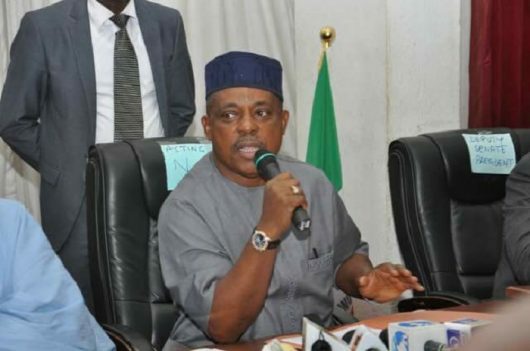 Secondus stated this while reacting to the siege on the National Assembly by the operatives of the DSS on Tuesday, preventing staff and law makers from gaining entrance. The National Chairman said that Britain should not allow its environment be turned into a haven for anti- democracy conspirators. Prince Secondus alleged in a statement from his media office signed by Media Adviser, Ike Abonyi that the President left the country to UK for 10 days medical leave to enable the nefarious activities they lined out against democracy be executed in his absence. He said that the final plan for the invasion of National Assembly was concretized when the minority leader Senator Godswill Akpabio visited the President in London at the weekend. He said, “When an executive arm in a democratic setting muscles up other arms of government, the correct name for such administration is autocracy and dictatorship. “Nigerians and international community have continuously watched this administration, harass and intimidate the legislature and Judiciary as well as others in opposition in their bid to create a dictatorial regime. “All over the World, the parliament is the bastion of democracy and rule of law anybody not willing to alien himself to them is trying to create anarchy in the land’, he said. Prince Secondus said that no amount of intimidation and harassment will deter lovers of democracy from pushing for the extinction of this wicked regime.